All proper vent is installed, Drywall tone Installed soon. Need your price to blow in after installation. 1. The crawl space is always wet except for the winter, and insulation gets wet as well. 2. Wood panel siding around the chimney needs replacing at the bottom and sides, and also on the roof where the roof meets the chimney, there was a leak and tried to fix it. 3. Sliding doors do not open and close well, and a piece under one of the sliding door sill rotted out. There me more projects, but not sure of exactly what your company offers. We would like an evaluation of our crawl space and pricing reducing moisture. We need crawl space renovation and advice. I need an estimate for closed cell spray foam insulation 2" for a 930 sq' crawlspace and 24' x 12' highwall shed. Above found cinder block basement walls. Setting up to finish a basement. We purchased a 10 year old home in Arrowhead Lake this summer. It has electric heat pump. We are interested in making the home more energy efficient. The doors and some windows are drafty as well as the outlets. We'd be very interested in your home inspection and estimate for improvements. "Crawl Space reconditioning Interior remodeling. We met..."
"Our shower install was not a big job as construction..."
"What can we say. We called Jeremy and he stayed engaged..."
At Burke Construction, we strive to be the very best we can be and perform to our highest potential. With over 10 years of experience, we have worked in numerous homes and have a wide range of knowledge on how to handle certain situations. We pride ourselves on our craftsmanship and customer service and have won four Super Service awards from Angie’s List in 2013. We are an accredited business with the BBB and a member of the BNI network. Don’t let your house problems effect you any longer, have Burke Construction solve your problem today! Is your home too hot in the summer or too cold in the winter? If so, we can help! 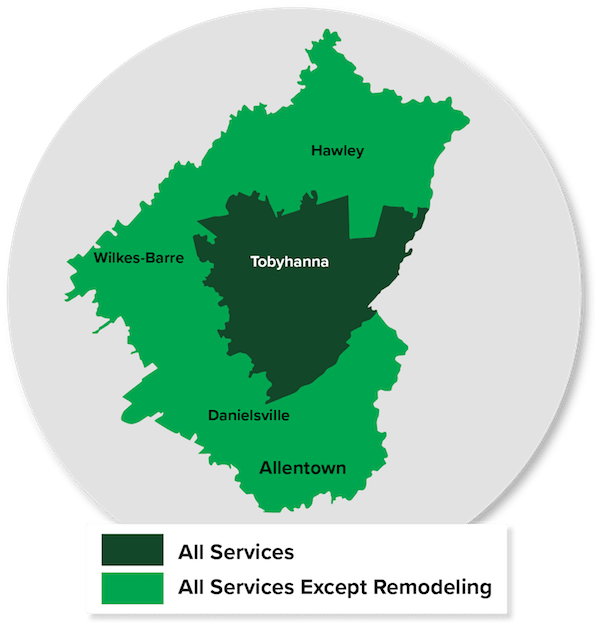 Burke Construction provides homeowners of Pocono Lake many different insulation options that are proven to improve the overall comfort of your home. As an authorized Dr. Energy Saver dealer, we fix uncomfortable homes with industry-leading products and services to make your home more energy efficient. We offer a wide range of insulation products including spray foam, rigid foam, blown-in, cellulose, and more. We are able to insulate every area of your home including the attic, basement, crawl space, walls, floors, and even the garage! If your home is uncomfortable, contact us today, we would love to help! Did you know that crawl spaces are often one of the most neglected areas of a home? In fact, the conditioning of your crawl space can impact the rest of your house. At Burke Construction, we offer a variety of crawl space repair and air sealing solutions that are proven to prevent moisture damage and improve the structural integrity of your crawl space. Our patented crawl space encapsulation system was designed to prevent the buildup of mold, moisture, and air seal your crawl space. If your home is facing crawl space issues of any kind, the experts at Burke Construction can help! A beautiful job that our technicians did at this home in Pocono Lake. The encapsulation is perfect and now they are not threatened by moisture in their crawlspace. Had water to home. Kitchen, bathroom, entry way gutted out by Service Master. Looking to rebuild. Walls, floors, ceiling. Crawl space getting dried out need insulation or something like your product.880 sq. ft home. Please give a price. I need to insulate my new home. We noticed damp smell in the crawl space and want a professional opinion on how to eliminate it. Standing water in the crawl space. Looking to remodel an unfinished basement. Build one bedroom, bathroom, kitchen and living area. At this time looking to receive an estimate on the labor, materials and estimated timeline.